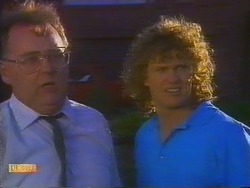 Joe about to punch Harold after misunderstanding how he ended up in Mrs. Mangel's bed. JOE: I thought you'd be *happy* for me to job him. I'm wonderin' you didn't do it *yourself*. JOE: Well, doesn't it worry you that he's been in bed with another woman? JOE: It sounds a bit far- fetched to me. MADGE: Don't you think the idea of Harold getting into bed with your *mother's* far- fetched? I mean, he may not be Mr. Universe, but he's certainly not *that* desperate. HAROLD (nods): That's right. [Then to Madge indignantly] What do you mean I might not be Mr. Universe?! HAROLD: I don't have to put up with this! Madge suggests to him that he come back inside. Harold, however, retorts that he'll come in when he's well and ready; *well and ready*! 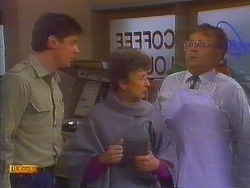 BRONWYN: Oh, er, I'd love to, Mrs. Mangel, but, um, I promised Des I'd help him out with Jamie while he does his housework. HENRY (grins): Jamie does housework...?! MRS. MANGEL: Very well. It seems that you and I, Joe, are left to represent our household at Morning Devotions. JOE (looking aghast): No way, mum – you're not dragging *me* to church. It's against me religion! 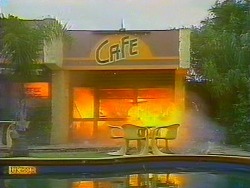 MRS. MANGEL (coolly): That is not funny. HENRY: No reasons, Mrs. M. – not while SuperMum's around to drive away the forces of evil! Harold snaps at Henry that he's sick and tired of his childish attempts at humour. Bronwyn chips in indignantly that Henry's just trying to help. Harold retorts that he can do without *that* sort of help. Madge suggests to him that he sit down quietly and relax and read the paper. Harold, however, mutters at her to stop mothering him. 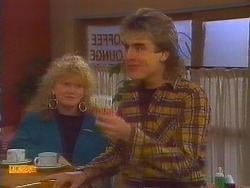 He storms out, leaving Mrs. Mangel to ask if someone can please tell her why Mr. Bishop is so upset. SHARON: Sure, Bronny – whatever you say! With that, she announces that she's going over to the Robinsons' to see what Nick's doing. Bronwyn heads off to No. 28. NICK: Yeah. It's pretty cool, isn't it? I'm not sure it's the way *I'd* do it, though. NICK: Well, if *I* was painting it, I'd go for Paul more the way *I* see him – you know: the high- pressure exec type. Lots of clock shapes in the background... the designs from the $100 note just sort of misting down... you know: ‘time is money' kind of thing. SHARON: That's unreal! Why don't you do it? NICK (thoughtfully): Yeah, I suppose I could. I've got to do something for Helen this weekend for an art class assignment. SHARON: Well, this would be perfect. Go for it! Nick says there's a photo of Paul in the bedroom – he can use that. He smiles at Sharon and thanks her for the idea. MADGE: You know, I really don't know how you managed to board with her. Think of those poor girls: what must their lives be like? HAROLD (irritatedly): Look, I could've done that myself, you know. HAROLD: I don't need help with every trivial little thing. I am *not* a *child*. MADGE: Of *course* you're not. Oh Harold, it's all this nonsense with Joe Mangel, isn't it. Well, don't worry about it – there was no harm done. HAROLD (retorts): Yes there was – to my *pride*. Go on, admit it: you think I'm a weakling, don't you. MADGE: Oh Harold, that sort of thing's not important to me. I love you just the way you are. HAROLD (exclaims): You *do* think I'm a weakling! HAROLD: Well, what about just now – that strap? I was perfectly capable of doing that myself. MADGE: Oh darling, of course you were – but if I do these little things for you it's just because I *like* doing things for you. If you don't like it – if you feel smothered – well, all right, I won't do it anymore. MADGE: Good. Now we've got that cleared up, let's get out of here before anything else happens. With that, Madge hands Harold a small canvas bag and *she* picks up the big rolled- up blanket and mat! Harold stands there looking annoyed! BRONWYN: Do you think he's feeling a bit better about us breaking up? DES: If you're wondering whether he'll be holding a grudge, don't worry – Mike's not the type. BRONWYN: I hope I did the right thing. I mean, he's a really nice guy; it's just we didn't seem right for each other. I couldn't see any point in getting more serious. DES: You did the right thing: either it's right with somebody or it isn't. BRONWYN: The problem is, how do you know – for sure, I mean? DES: I don't know about anybody else, but with Daph... I knew as soon as I laid eyes on her. BRONWYN: No. It's hard to take Henry seriously. He's just a big kid. BRONWYN: I just don't want to start anything again unless I'm really sure. I want to be like you and know it's right from the word ‘go'. DES: Be serious, Bron. You're 18- years- old. You're just finding out about people; about life. Just take things as they come. Don't put so much pressure on yourself. The doorbell rings suddenly. As Des goes to get it, Bronwyn thanks him for the talk. Des opens the door to find Harold standing on the step, and he tells Des that after church he might pop down and open up the Coffee Shop for a while. Des remarks that they usually only open on a Sunday if there's a conference on at Lassiter's. Harold nods that he knows that, but now that he's a partner he should be looking for ways to improve the business. Des shrugs that they've got nothing to lose. Harold says mutedly that he'll let him know how it goes. He goes to head out. 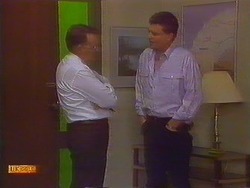 As he does so, Des looks at him in concern and asks him if he's all right. Harold murmurs that he's just a little tired: they all had a rather uncomfortable night at No. 30. 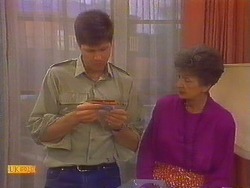 MRS. MANGEL: I'm *not* bullying him; I'm merely pointing out what's in his best interest. *Some* of us have a little concern for our family's spiritual welfare. MADGE (demands): What's *that* supposed to mean? MRS. MANGEL: Well, we all know that the church hasn't been *built* that will ever see your *Henry* in it. MADGE (growls): You *think* that, do you? MRS. MANGEL: I don't *think* it, I *know* it. MADGE: Well, you don't know as much as you *think* you know, because Henry's already agreed to go to church with me [turning to Henry and cuffing him on the scruff of the neck!] – *haven't you*, love? 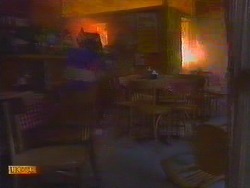 [Turning back to Mrs. Mangel] So we'll ask the Reverend Sampson to hold a seat for you – obviously only *one*. Joe stares at Madge and then looks at his mother. He sighs that he supposes he could go – just this once. Mrs. Mangel smiles at him that he won't regret it: he'll be spiritually uplifted. Henry grins at Joe and puts his hands together as if in prayer! JOE: Mum, I might just slip over the Waterhole and have a couple of quickies. MRS. MANGEL (firmly): You're not going straight to that place after church. We'll have a nice cup of tea. Sit. JOE: That's a real pretty apron, Harold! Suits ya! MRS. MANGEL (quickly): Of course not, Mr. Bishop. Joe – apologise. JOE: Are *you* gonna make me? HAROLD: If I have to. JOE (pointing to his chin): Well, go ahead. HAROLD: I *will*, by golly. SHARON: You're just lucky Mrs. M. was there! HAROLD (indignantly): Do you mean to say you don't think I could've handled that- that- that- that roughneck? SHARON: Are you kidding?! If she'd turned him loose, we'd be taking you home in little bags for the kittens! Face it, Mr. Bishop, that's twice today you've had your life saved. Maybe you should quit while you're ahead! Harold stands there looking annoyed. VANESSA: Straight little country girl, eh? If you want to get by here in the city, you'd better grow up, I reckon. NICK (coolly): Why – so she can act real immature like *you*? VANESSA (retorts): I wasn't talking to *you*, Nick. SHARON (to Nick): I *can* speak for myself, you know. VANESSA: Are you serious? You've never smoked a cigarette? SHARON (shaking her head): No. VANESSA: Well come on – try one. You don't want to be a dag, do you? She holds out the pack and Sharon takes out a cigarette and stares at it. JOE: Maybe you *don't* need it – there wouldn't be too many burglars game enough to take *you* on! MRS. MANGEL: Once a week isn't going to hurt you, dear. JOE (firmly): Churches are for weddings and funerals and I don't plan on having *either* for quite some time, thank you very much. SHARON: Why would anyone in their right mind want to do *this*? It tastes *foul*. VANESSA: Give it a chance – you need more than one puff. SHARON: No thank you – I can live without it. VANESSA (mutters): If you want to be a droob all your life, it's up to you. HAROLD: Filthy habit. We'll open up tomorrow and the place will stink of stale smoke. With that, the two of them head out. JOE: At least you don't have to worry about some moron getting into your bed! MRS. MANGEL: Oh now, I won't have you talking about Mr. Bishop like that – it was just a silly mistake. But it *is* lovely to be back in the peace and quiet of one's own home. JOE: Yeah, well, er, must be a bug in the system or something. I'll sort it out. Don't worry, mum – I know what I'm doing. Des – carrying Jamie – and Bronwyn are walking across the complex. They go to head to the Coffee Shop, but Des comments that it looks like they've closed up and gone home. Bronwyn, however, comments that there's a light on in there. 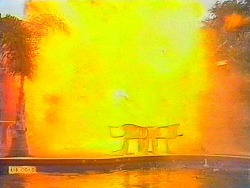 Des approaches the shop – and then realises that it's not a light, but flames in the kitchen. 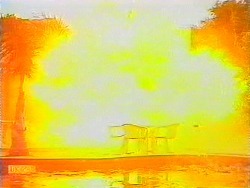 Looking round at Bronwyn, he yells at her to call the fire brigade. He then takes out a key and opens the shop door. 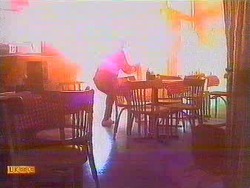 He dashes behind the counter and picks up a fire extinguisher before heading into the kitchen to start tackling the flames. 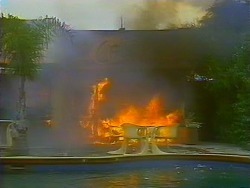 Outside, Bronwyn has dialled the fire brigade and she asks them to please hurry.